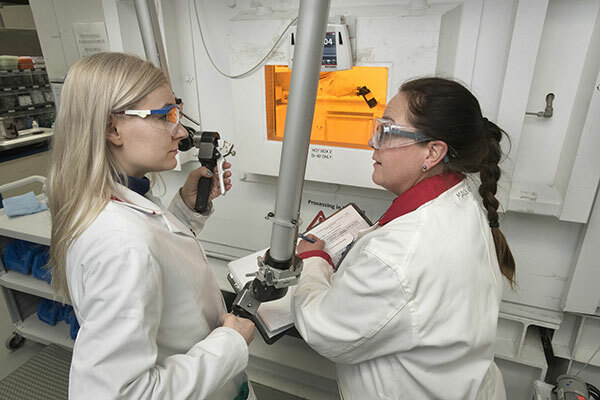 Brookhaven National Laboratory operates one of just a few facilities in the U.S. with a high-energy particle accelerator needed to produce certain critical medical isotopes—radioactive forms of chemical elements that can be used to track and target disease. 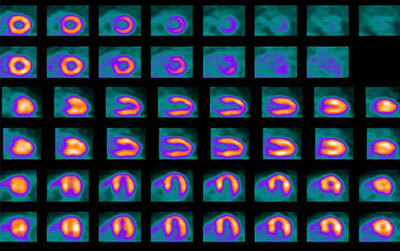 Radioisotopes made at the Brookhaven Linac Isotope Producer (BLIP) and the radiotracers made from them allow U.S. physicians to perform millions of medical imaging scans each year to non-invasively detect heart disease, cancer, and other ailments, and monitor patients’ response to treatment. Precisely controlled beams of charged particles are aimed at small puck-shaped targets. The beam knocks subatomic particles from the targets’ atoms, transforming them into the desired radioactive element. As the beam exits one target, it can transform the next target in line. Transformed targets undergo further chemical processing to yield a pure product that can be injected into patients, or a precursor chemical that can easily be transformed into the desired isotope or tracer on site at a hospital. Scientists in Brookhaven’s Medical Isotope Research and Production Program are developing new radioisotopes for precisely targeted cancer therapy. These agents deliver cell-killing energy directly to tumors while sparing healthy tissue, offering potential for high cure rates with minimal side effects. 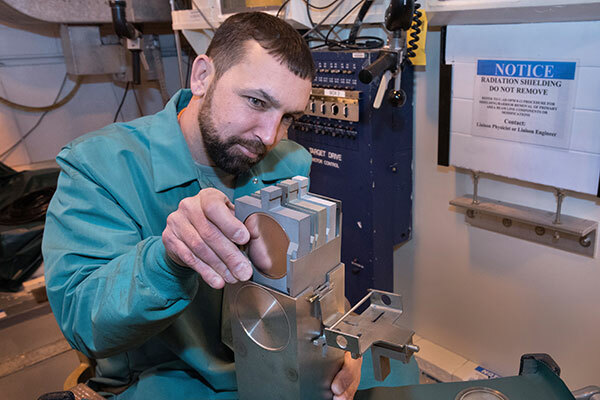 To maximize the use of target materials and increase radioisotope production, Brookhaven installed a new “beam raster” system—a series of magnets that steers BLIP’s energetic particle beam to “paint” the targets, rather than depositing all the energy in one spot. This cuts down on the buildup of target-damaging heat, allowing operators to increase beam current and transform more target material into the desired product. 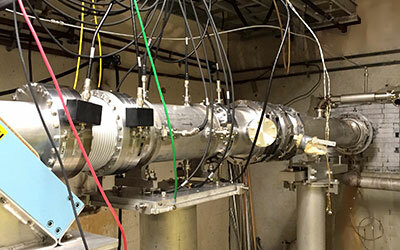 BLIP is part of Brookhaven Lab’s Collider-Accelerator Complex, operating symbiotically with the nuclear physics research program at Brookhaven’s Relativistic Heavy Ion Collider (RHIC). The two facilities—one exploring fundamental forces and the building blocks of matter, and the other producing life-saving medical isotopes—make use of alternating pulses of energetic protons and share operating costs and staff. The energetic protons produced by the accelerator can be precisely degraded to a wide range of energies— from 202 million electron volts (MeV) down to whatever energy is needed to produce the desired isotopes. No other facility in the U.S. has this capability. A BLIP operator prepares targets for irradiation. Processing samples to extract radioisotope product. 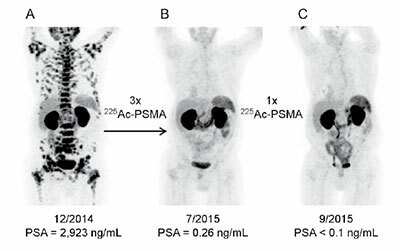 Before and after images show how a molecule labeled with the radioisotope Actinium-225 delivers cell-killing alpha particles directly to tumors eradicating metastatic prostate cancer. Strontium-82 is used to generate a Rubidium-82 radiotracer that reveals reduced blood flow in heart muscle under stress. This precision scanning points physicians to coronary arteries that need treatment. 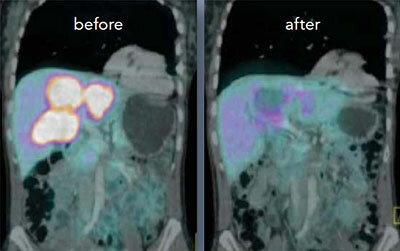 Germanium-68 generates Gallium-68, a radiotracer used to monitor how multiple liver lesions (bright spots in “before” image) respond to cancer treatment. 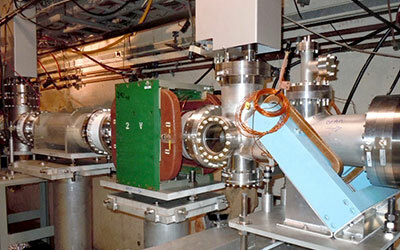 The BLIP raster system consists of a series of magnets and beam monitoring devices that steer the accelerated proton beam in a circular fashion as it enters the target area. 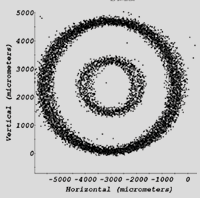 This circular “rastering” sweeps the beam at a radius of 12.5 millimeters for 4 consecutive 450-microsecond pulses (making 2.25 rotations per pulse), followed by a sweep at a radius of 5.5 millimeters for one pulse, repeating this pattern continuously. The circular movement provides an even distribution of beam on the BLIP target by spreading out the power density. “Painting” the targets in this way extends their lifetimes and allows BLIP to operate at higher beam current to increase production of desired radioisotopes. 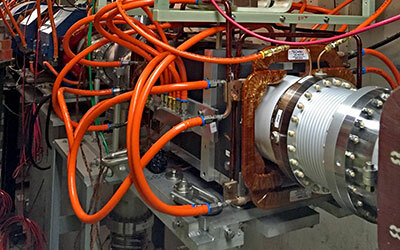 (a) A raster magnet installed in the beamline directs the proton beam to “paint” targets downstream. (b) This section houses a vertical steering magnet and equipment to monitor beam intensity, shape, and position. (c) Beam position monitors track the beam as it travels through this transfer line into the target area.